In October I had the good fortune to spend two and a half weeks in Berlin visiting my son who has lived there for seven years, seeing lots of art, and experiencing the daily life of a Berliner. It was a profoundly moving experience for me and it will take a long time to process all that I thought and felt. A highlight of the trip was being present for a 240,000 person demonstration against racism. It is clear that Germany has not forgotten the devastation caused by that bigotry and hate and is announcing to the world that it is not to be tolerated. It touched the fears I have for America but gave me some hope that it’s not too late for humanity to triumph. When I returned to my studio, I wasn’t sure how I would translate my experience into my painting, and I still don’t know. But I am trying to let my subconscious take over and two paintings that I am working on seem to be filtering some of the contradictory feelings. I am exploring the idea of conflict in emotions and thoughts. 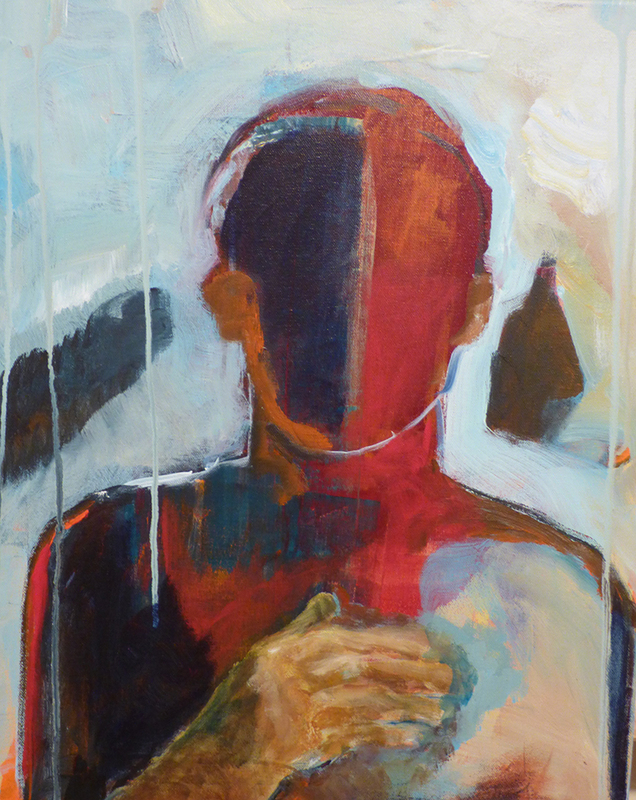 The smaller painting, Hand on Heart, evokes the duality of the human experience. There is darkness and light and they can’t really exist without each other. Sometimes, it’s hard to embrace our shadow side but it’s part of who we are and the complexities of our actions result from that push-and-pull. The larger painting, Family Portrait, is filled with bright colors and patterns and represents the vitality and strength of people overcoming strife and trauma. It’s a quiet painting in the composition but I hope to show that we, as humans, are capable of seeing the joy that is available in life. I’ll share a quote from Wendell Berry, “Be joyful though you have considered all the facts.